Ananti Namhae continued its success at the World Golf Awards, selected as Korea’s best golf hotel for the fifth consecutive year. The World Golf Awards, a prestigious tourism industry award, serves to highlight excellence in golf tourism, world-class courses and golf destinations. Golf travel and tourism industry professionals and golf tourism consumers cast their votes from February to September. 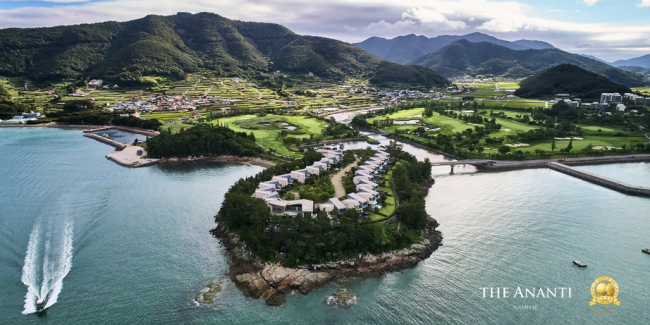 Ananti Namhae features the first seaside golf course in Korea. Due to the moderate climate of the southern coast, guests can enjoy golf all year round. After playing golf, the players can enjoy dining at restaurants on the property. “We are happy to achieve good results at the World Golf Awards following the World Travel Awards,” Ananti CEO Lee Man-kyu said, referring to how the hotel was also selected as Korea’s leading resort at the World Travel Awards 2018 in September. “We will do our best to maintain our golf courses in the best condition, of course, and also work on offering the best service to make Ananti Namhae beloved by golfers,” Lee said. For more information, call Ananti Namhae at (055) 860-0100 or check its official website at www.theananti.com.